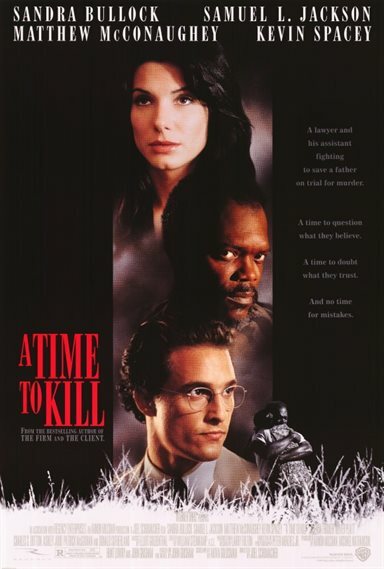 Carl Lee Hailey (Samuel L. Jackson) takes the law into his own hands after the legal system fails to adequately punish the men who brutally raped and beat his daughter, leaving her for dead. Normally, a distraught father could count on some judicial sympathy in those circumstances. Unfortunately, Carl and his daughter are black, and the assailants are white, and all the events take place in the South. Indeed, so inflammatory is the situation, that the local KKK (led by Kiefer Sutherland) becomes popular again. When Hailey chooses novice lawyer Jake Brigance (Matthew McConaughey) to handle his defense, it begins to look like a certainty that Carl will hang, and Jake's career (and perhaps his life) will come to a premature end. Despite the efforts of the NAACP and local black leaders to persuade Carl to choose some of their high-powered legal help, he remains loyal to Jake, who had helped his brother with a legal problem before the story begins. Jake eventually takes this case seriously enough to seek help from his old law-school professor (Donald Sutherland). When death threats force his family to leave town, Jake even accepts the help of pushy young know-it-all lawyer Ellen Roark (Sandra Bullock). Download A Time To Kill in Digital HD from the iTunes store. A Time To Kill images are © Warner Bros.. All Rights Reserved.